As the climate changes in the Arctic, indigenous communities living in the Far North are seeing an impact on the environment around them. As these communities depend heavily on living natural resources such as fish, beluga whale, seals and other animals as a primary source of subsistence, any impact climate change has on the ecosystems in which the Inuit live will ultimately have an effect on their way of life. The intimate understanding they have of the environment around them gives indigenous Arctic peoples special insight into the changes in ecosystems taking place as climate change gradually alters the face of the Arctic, and researchers can use this to their advantage in conducting studies. What follows is a brief look at one project currently being conducted in Nunavik, the northernmost region in the Canadian Province of Québec, in which researchers are combining the traditional ecological knowledge (TEK) of the local Inuit population with scientific data collection in order to get a better understanding of how climate change is affecting ice cover in lakes and streams in Nunavik and how this is affecting populations of Arctic charr, a fish common in the Arctic that the Inuit use as a staple food source. Through this, the Nunavik Research Centre (NRC) hopes to be able to come up with better strategies for Inuit to adapt to these changes. The NRC, headquartered in Kuujjuaq, Québec, is the scientific research arm of the Makivik Corporation, the official body that legally represents and serves the needs of Inuit communities in Qu&ecute;bec. The NRC has been conducting research on topics and issues related to the needs of indigenous populations in Québec's Nunavik region for over 30 years, serving the 10,000 Inuit living in the 14 different Arctic and sub-Arctic communities throughout Nunavik. The use of traditional ecological knowledge, or TEK as researchers from the NRC like to call it for short, has always formed the basis of any research programme the NRC conducts. The reason for this, as Adam Lewis, Geomatics Manager of the Nunavik Research Centre, states is that "observations from indigenous people who live on the land and use it everyday are far superior to the observations of a scientist who travels to the north and spends a limited amount of time on the land." Even indigenous place names are a very rich and important source of information, as their names describe physical features of the place or what it is used for, giving insight into the local ecosystem and how it might have changed over time. For example, the Nunavik village of Ivujivik gets its name from the Inuktitut word meaning "place where ice accumulates due to strong currents," while the name of the village of Salluit means "the thin ones," a reference to a time in the village's history when residents faced starvation due to a lack of wildlife available to hunt and fish. Having collected traditional ecological knowledge since the mid 1970s, when the Makivik Corporation was founded under the terms of the James Bay and Northern Quebec Agreement, the NRC has amassed a large amount of TEK from the indigenous Inuit of the region. The NRC's TEK database consists primarily of recorded interviews with hunters who travel out on the ice and contains more than 86,000 geographically-referenced data entries on plant and animal species (including species occupancy and harvesting information), travel routes, ecology, and ice information. Since elders in the Inuit communities were interviewed as early as the mid 1970s, the NRC's TEK database contains information on environmental conditions in Nunavik going as far back as the beginning of the 20th century. In addition to providing superior insight, traditional ecological knowledge in Nunavik is far more plentiful than the amount of hard scientific data that researchers have gathered in the region. The long historical record of the TEK database makes it possible to track changes over time - something that's not always possible with more scant scientific data. Changes in species migration routes, changes in the travel routes hunters take to reach certain species and changes in the locations where certain species can be hunted are a few examples of phenomena that can be tracked. With the volumes of TEK data they've collected over the past few decades, the NRC is putting this indigenous knowledge to good use in a monitoring programme focused on how changing ice cover on lakes and streams in Nunavik affects Arctic charr, a fish that forms a major part of the diet of Nunavik's Inuit population. Conceived in response to a major Arctic charr die-off that occurred at Lake Tasikallak in the spring of 2002 following a spring that saw anomalous ice cover, the idea behind the study is to use its vast traditional ecological knowledge database along with scientific data gathered using in-situ measurements and satellite imagery to look at how climate change is affecting ice cover in bodies of water in two specific parts of Nunavik, and the impact these changes are having on Arctic charr populations. 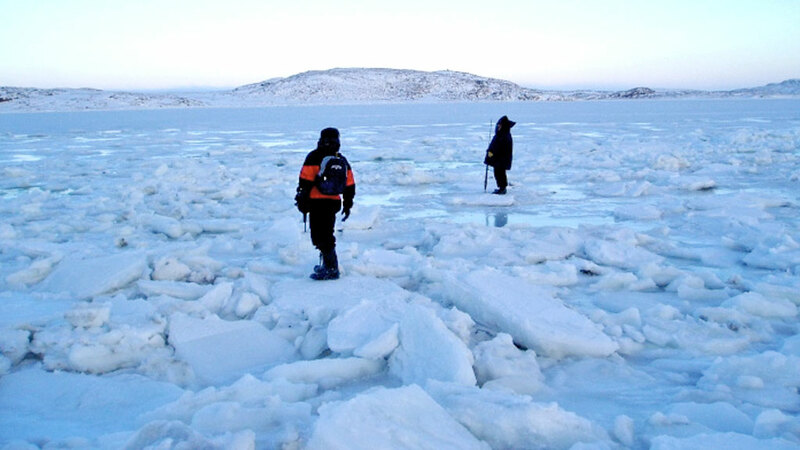 Since the autumn of 2007, the programme has been monitoring ice cover between the time of ice development in the autumn until the time of ice break-up in the spring. Two key fishing areas around Ungava Bay are targeted in the study. The first is at Lake Tasikallak, where the major Arctic charr die-off occurred in 2002, and the other at Kangirsuk on the Payne River, which has seen a noticeable drop in Arctic charr over the past several years. Using the TEK database that the Nunavik Research Centre has been accumulating since the 1970s as a baseline, both scientific and TEK are being collected in the study. Data collected during the monitoring taking place this year will build on data collected from last year. The scientific data collection is quite straightforward. At Lake Tasikallak and Kangirsuk, the NRC has placed a remote HOBO weather station, a solar-powered device that monitors temperature, wind speed, wind direction, wind gust, barometric pressure, solar radiation and light levels. At Tasikallak a shallow water ice profiler (SWIP) has been installed under the ice to monitor ice thickness and record echo-soundings from fish to estimate the size of fish populations, and at both locations, indigenous hunters are measuring ice thickness by taking ice cores from the lake or river ice to measure its thickness. In-situ ice thickness measurements taken at both locations will validate data being collected by Polar View, a multi-national conglomerate of public and private institutions specialising in earth observation technology. Polar View's Canadian member organisation C-CORE is providing regular satellite imagery of the Ungava Bay region via the European Space Agency's RADARSAT-1 satellite. Additionally, data from stream enhancement projects that have been conducted in the area in the past will also be used in the project. This is because data from these projects includes information on key areas of the streams, in particular location where charr migration could become blocked and where charr may potentially be abundant. The traditional ecological knowledge being used in the study draws on recorded information about ice, various flora and fauna (marine mammals, land mammals, fish birds, sea plants, terrestrial plants), travel routes, and charr over-wintering areas as baseline data. TEK collection will also include weekly reports from indigenous hunters as they travel throughout Nunavik. If the hunters notice any anomalies, representatives in Polar View are alerted to the anomaly so they can make efforts to take satellite imagery of the region in question. TEK observations will be catalogued and cross-checked with observations taken via in-situ and satellite observations. End users in the communities will be kept up to date about any additions to the TEK database. On top of this, TEK will be collected using the Northern Village Data Collection System (NVDCS), an interactive online mapping system the Makivik Corporation developed in 2005. The NVDCS allows any user with Internet access to record his or her observations at any time. Unlike traditional interviews where someone has to travel from community to community to collect information, or aerial surveys, which can get very expensive, this new system allows TEK to be collected at any time by anyone. All TEK and scientific data that the instruments, satellites and people collect will be uploaded onto a website specifically dedicated to the monitoring project. At the end of the project, a summary report of findings will be prepared for each of the two locations being studied. These reports will contain climate and ice data from the time of ice formation and ice depletion over the course of a several seasons and will provide baseline data for future monitoring projects in the region to determine how climate factors are affecting ice growth in key over-wintering fishing areas. And most importantly, the methods of collecting and integrating TEK and scientific data will be analysed to improve adaptation measures Inuit can take in the face of these changing conditions. Nunavik Research Centre's Adam Lewis talks more about traditional ecological knowledge and the monitoring programme in an interview published on SciencePoles. The long historical record of the TEK database makes it possible to track changes over time.